I am very blessed to have been given the opportunity for an oracle reading by Sheena Cundy, fellow Moonstone- writer, witch and friend. 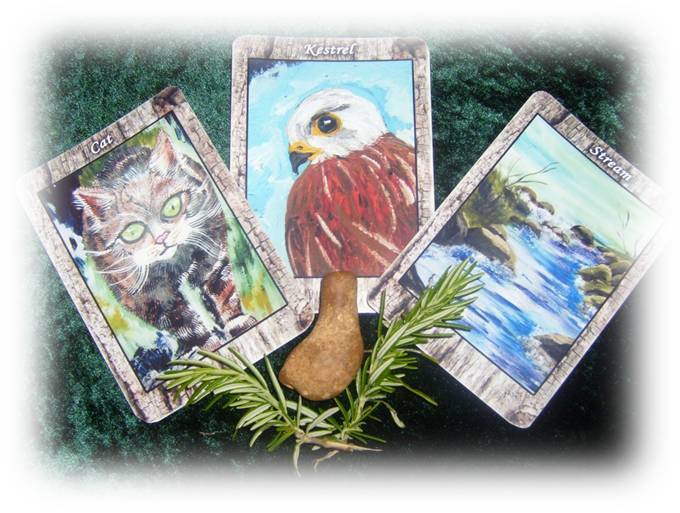 What makes this reading especially, well special, is that The Magic of Nature Oracle Cards have been designed by Sheena and her sister Tania, and the cards are truly beautiful. So, I thought I would review the reading I was given, and at the same time share their cards with you all. Presentation: the presentation of the email was beautiful. As it was distance reading, it was emailed to me as an attachment. At the top of the reading was a photo of the cards that had been chosen for the Wake Up, Rise and Shine spread. The Cards: the deck illustrations are based on British wildlife and nature. As you can see in the picture, the cards dealt were the Cat, the Kestrel and the Stream. The Card Meanings and Interpretation The meaning of each card was given in turn, and alongside its interpretation in relation to its position in the spread. Both the card meaning and its interpretation was very clear and concise. Along with each card a magical mantra was also provided. What did I think to the reading? The reading was spot on and accurate. Sheena’s wording left me in no doubt of what she was telling me via the cards. The interpretations flowed and although the reading was done over distance I felt the connection to both Sheena and the cards. So overall, am I happy with the reading? I most certainly am. The experience was certainly worth it, and the anticipation I felt as I awaited my reading was immense. Even so, I was not disappointed. The connection felt genuine and the guidance received definately resonated with me. It was exactly what I needed to hear at the time of the reading. I couldn’t have asked for more. Sheena Cundy is available for readings. The Magic of Nature Oracle Cards App is soon to be available. Please visit her website (here) for more details. This entry was posted in On My Travels and tagged oracle card reading, oracle card reading review, oracle cards, Sheena Cundy, the magic of nature oracle cards. Bookmark the permalink.